Improving health, awareness, and work efficiency – all can be achieved by changing a single component of your surrounding environment – the indoor air quality. Using air monitoring instrument is important step toward to understanding your surrounding environment and improving the quality of your life. 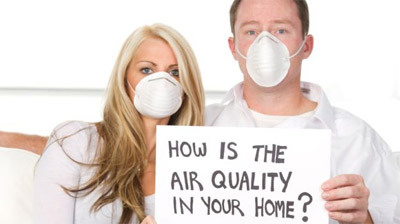 After all, the air is one of the most important factors affecting the comfort level inside your house or office. Without food human body can live for several weeks, without water – a few days, and without air just a couple of minutes! This is a comparison table of some of the best air quality meters on the market. For detailed overview of each device please scroll. Volatile compounds and how we can monitor them? Sometime the impurities that lower the quality of the air are visible and perceived. We can immediately identify them and take necessary action to protect our self – like open the window, get out of the room, or use a damp cloth to protect us from inhaling them. But there are times when the air contains particles invisible to the senses. This kind of particulate matter can cause wide variate of health issues. That’s why we need air quality monitoring system to detect them. For places where you spend most of the time, long-term health and comfort are dependent upon the quality of the air inside. For example, if the concentration of CO2 exceeds the normal limits this may result in fatigue, decreased concentration, headaches, and other health conditions. Particle pollution, because of the small solids, can also be the cause of serious health problems. For situations like these you will need air quality monitoring device that will alert and display all the current parameters of the air you breathe. Things to consider when buying air quality monitor? First and foremost – what type of air pollutants you want to detect? For example there are different compounds such as carbon dioxide, carbon mono oxide, hydro carbons, or particulate matter ( bacteria, mold or pollen). Different models detect different compounds and particles. The types of air quality meters we are going to review today are – particle counters, CO2 monitors and the combination of both. The second important factor is where you want to mount your air monitor. Most of the time people place their meters indoor to monitor the ambient environment inside specific room. Sometimes they are put outside to monitor outside pollution. And sometimes they can be handheld mobile devices useful for large areas such as schools, and office buildings. Dylos DC-1100 PRO – is a laser scanner that counts the number of airborne particles. Such particles can build up form dust, pet dander, or chemicals from house hold cleaners. If you have been leaving your windows open, may be some pollen or dust has traveled into your home from outside. The air particles counters are great way to get an idea of the air quality, so that you can know how to act toward improving it. 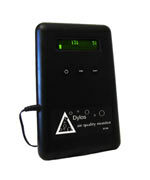 With this gadget the number of particles is displayed on a small LCD screen. The device is able to accumulate statistics about changes in the concentration of various particles within a certain time (minute, hour, and day) and store the collected data for the last month. An analysis of this data will identify patterns and will provide knowledge of the causes of air pollution inside your home. This monitoring device can also give you info about the efficiency of your air purifying devices. 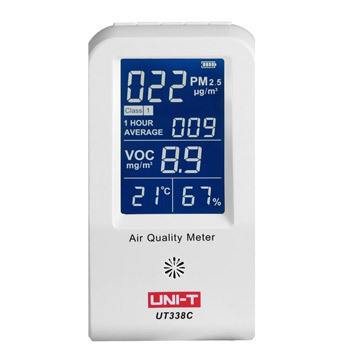 This particle air quality meter is very easy to use – just plugged in, and turn it on, and about couple of seconds later you are going to have particles register on the LCD display. The unit will need about 15 minutes to “settle down” and give accurate base line air quality levels in your home. With the info of knowing what your baseline is, you will be able to know when you have high particle count. The reason for this may be – clogged air conditioning filter or pollen for the outside is entering inside. DC-1100 PRO is very useful in evaluating and making sure those air purifiers, screeners and scrubbers are doing what they are designed for. With this tool you can test your HVAC vents to make sure they are clean and you don’t need a duct cleaning done. This device will not tell you what type of particles are exactly in the air, but will tell you the number of particles in 100 foot3 of air. The numbers of small particles are displayed on the left and the large are displayed on the right. To get the actual particle numbers multiply the number by 100. The chart on the back of the unit will give you general idea of the particle count relative to the air quality. On the market you can find two types of Dylos particle counters – the one that can be calibrated for 0.5 micron (PRO) participles and the other – 2.5 micron (Standard). 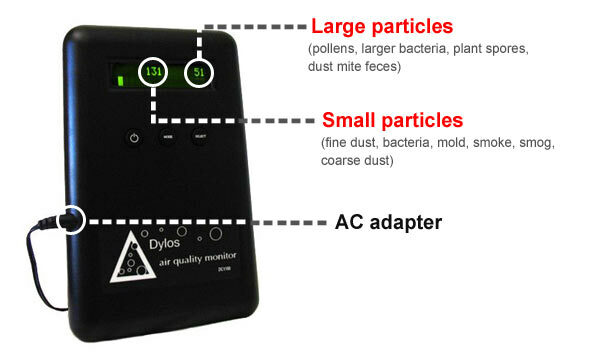 Quality device that accurately measures the particulate matter inside your home. It is very well build and a lot of people already using it are quite happy with it. Very helpful for people suffering allergies and asthma to help determine best time to turn on their air purifiers, HEPA devices, or just open the window. It’s great addition to any air purification system. This problem may also occur inside your home. For example inside your bedroom, where the windows and the doors are often closed, the carbon dioxide level can rise very quickly. In this regard one may wake up tired, with a headache and a bad mood, and write it off as chronic lack of sleep. To understand the true cause of the problem, it is necessary to measure the concentration of carbon dioxide in the air before going to bed and in the morning when you wake up. 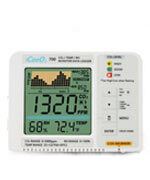 Let us look at two of the best selling home carbon dioxide meters currently available on the market. The device is easy to operate and requires no additional skills. The only thing you need to do is to connect it to the power grid with the AC adapter included in the package. 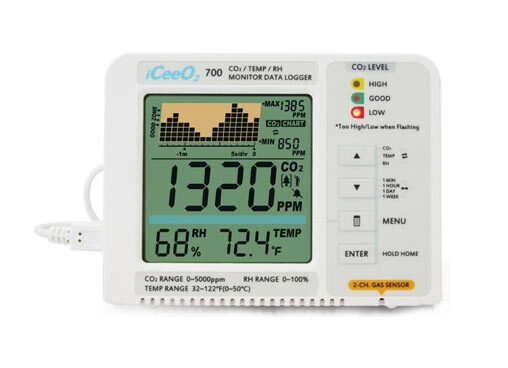 Then, within seconds the device will start collecting data and displaying it on the LCD screen, indicating the current level of CO2 in your home. The TIM10 also has a thermometer and humidity meter which can measure temperature between 0 – 120F and relative humidity between 20%-99.9%. These two additional instruments can be quite helpful for monitoring your living space for mold development conditions. The device can be moved around the house to check each location for CO2 levels or check if your HVAC system works properly. High levels of this gas can mean there is some damage or blockage to the air ducts. Alarm will indicate when the level of carbon dioxide inside the rooms has build up, and the time has come to open the window or turn on the air conditioner. There are two alarm thresholds – one for CO2 levels requiring ventilation and one when ventilation is no longer needed. 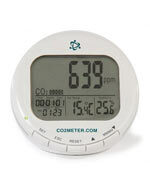 Large and readable LCD display presents all the necessary info – Carbon Dioxide levels, and temperature and humidity. The digital display has super convenient indoor air quality icon – Good, Normal, and Poor -for people not yet familiar with ppm scale. The min/max feature will give you the minimum and maximum carbon dioxide levels during the day. The meter is factory calibrated (400 ppm), but manufacturer recommends regular calibrations in order to keep your device accurate. The manual is easy to read and has all the info on installation, maintenance, and alarm features. It is an awesome instrument for home environmental testing. If you want to be FDA compliant and keep the levels CO2 below 1000 ppm, while reducing the carbon dioxide health related issues at minimum – this tool will do just that. We highly recommend this device. The monitor is very responsive, will track your indoor CO2 levels very accurately, and alarm you when there is a problem with the air quality. iCee02 is environmental testing meter that detects carbon dioxide, comes with very competitive price, and has couple of interesting features. The device itself is housed in small convenient box with large and easy to see LCD display. The screen is clear and has all the necessary info presented in well arranged manner. At the top you will find the graph (Curve Tracer) that will give you history data for certain time period. This includes – carbon dioxide levels, temperature, and relative humidity levels. Bellow the graph you will find the CO2 ppm readout with big and easy to see, even form distance, digits. At the bottom of the screen the humidity and temperature numbers are showing the current state of the surrounding air. The top right corner displays the min and max values for the selected parameter. One of the major benefits coming with this air quality measuring device is the power source. Unlike the other devices listed so far, the ICee02 doesn’t come with proprietary power supply. On contrary – the iCee02 is equipped with mini USB port and because of this it can be charged by any USB ready device – like laptop, power adapter, or external battery. The last option will let you move around the house or office freely, and monitor the internal air quality (IAQ) almost anywhere. It is visible that the manufacturer has put some thought on the possible use cases, and because of that, has added some interesting features. The most noticeable one is the plant and human feature that changes the devices’ report and alarm functionality. The Plant mode function provides the user with option to change between certain types of plants presets (orchid, potato, strawberry, tomato, etc.) and by thus receive the most optimal settings for them. When changed, the LED lights for HIGH, GOOD, and LOW values will blink according to these new presets. The human mode will restore the reporting mode back suitable for normal living environment. With the custom mode the user can define their personal LOW, GOOD, and HIGH zones. iCee02 has a historical chart graph with variable time span levels that can be set by the user . With this chart you’ll be able to see historical data from all onboard sensors, for the past minute, hours or 7 days. The chart is easy to read and understand, but be sure to check the user manual for additional info regarding this feature. The CO2 sensor inside the unit is a standard 2- channel NDIR sensor, typical for this class. iCeeo2 is a good device and most of the users are quite happy with their purchase. It has some useful features that do what they are suppose to do. This is highly recommended product to anyone looking for affordable air quality meter. Amprobe CO2-100 is a portable CO2 meter using NDIR technology to ensure the reliability and long term stability of indoor air quality. 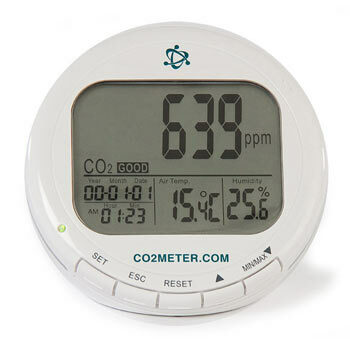 The small and portable construction makes this meter very useful for measuring carbon dioxide levels at larger scale settings such as schools, offices, hotels, and factories. In addition to its main feature you will be able to measure air temperature, relative humidity, and dew point. The liquid crystal display is large and presents the data in clear and sharp image with all tree sensors sectioned their own separate readout. This is a bonus, because some of the other hand held devices on the market have displays that are too small or not clear enough. The ability to measure CO2 instantly is extended with two additional measuring capabilities – 8 hour long period and short 15 min period. This report presents a very clear picture of average C02 levels during the selected time span. The meter has a power saving mode which automatically turns off the instrument after 20 minutes of inactivity. This feature is super useful and will spare your battery (4 AA) substantially because quite often, because of its portability, the device is forgotten to running on a table or somewhere in the office. Trough the USB connector you have the option to download the entire data log from the device for observational and statistical purposes. 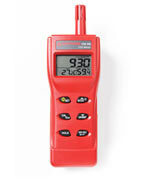 Amprobe CO2-100 is easy to use and set up. It is factory calibrated and has good accuracy. And because it is portable it will inform you about hazardous conditions wherever you are. Footbot is air analyzing device loaded with lots of features. It is perfect for people who want to have a modern device with high quality design, complementary mobile phone app, Wi-Fi connection, and the power to look at data reports from anywhere in the world. Foobot contains sensors that detects volatile organic(VOCs) compounds in the air such as Methane, Ammonia, Benzene, Iso-Butane, Formaldehyde, Toluene, as well as solid particles in the range of 0.03 to 2.5 PM. In addition, it measures the temperature, humidity, carbon dioxide, and carbon monoxide. The device has the option to notify the users for changes in the air, even when they are not at home. This is possible due to Foobot’s capability to connect with the home network trough Wi-Fi. Foobot has 6-level LED scale, that shines in different color (blue to red) to inform about changes in the air quality. 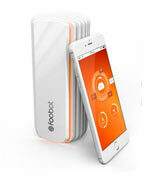 All data is transmitted via Bluetooth or Wi-Fi to a mobile device and can be viewed with the help of the Foobot’s app. To see the latest data, you just simply double tap on Foobot’s body. Foobot is so much more than just a device for monitoring. 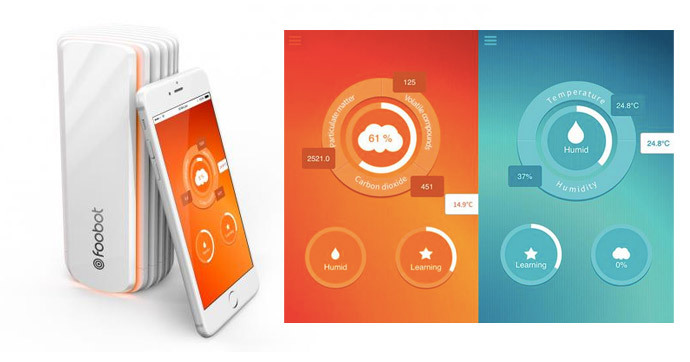 The mobile App provides useful tips on how to preserve the quality of the air. It provides individual training sessions on how to maintain air quality inside the house. With this application, that is both simple and effective, complex scientific data is translated into plain actionable insights. The device is easy to set up, it connects instantly, and the initial setup lasts only 40 seconds. Easy to understand color coded air quality report. According to most of its users Foobot is quality product which detects wide range of VOCs and particulate matter. The device has modern design and will fit perfectly on your home. Most of the people say that the monitor is accurate and they are quite happy with their purchase. Some people report that they have issues with the app, but given that the software is updated constantly, it is possible that these problems can be eliminated in the near future. 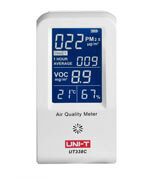 Uni-T is inexpensive, VOC and particulate matter indoor air monitor with temperature and humidity meter. It is not as “shiny” as the Foobot but does a similar job at more affordable price. It is simple to use, portable and compact. The setup process is extremely simple – you just have to turn on the device and the data will appear on the screen. The VOC sensor needs to settle for an hour to give the most accurate reading. To power the meter, you can use the included rechargeable battery or the provided adapter. Using the adapter will restrict the mobility of the device. On the other hand using the battery will restrict the operational time of the meter because the battery is a bit weak. The unit has mini USB port which is best used in combination with a power bank battery. This combo will add a lot of working time to the meter. The PM2.5 measurement is in the range of 0-500 with resolution of 1ug/ m³ and volatile organic compound with range 0.0 to 9.9 with resolution of 1mg/ m³. You will be able to detect humidity levels from 5% to 99% with resolution of 1% and temperature from -4 ° F to 122 °F. For people not familiar with the CO2 scale, small happy face icons will blink on the screen if the current levels of VOCs are normal. If level rises the icon will change to unhappy face. Similar to Foobot the Unit-T changes the display color from blue to red if there is high particulate matter in the air or some volatile compound has settled in. This feature will let you tell very quickly if there is a problem with the air inside your home. It is a great basic IAQ meter. It’s reliable unit and will allow you to measure the things you need to measure. It has the most important features air quality meter needs. Sure, there are better professional instruments with more features, but they come with a higher price tag. This will definitely meet your needs if you are just looking for basic air quality meter.